Dare County was near the top of the state’s 100 counties in visitor spending last year, collecting more than $1 billion in revenue, a 7 percent increase over 2013, according to Gov. Pat McCrory’s office. The announcement on statewide visitor spending comes as McCrory pushes an economic development plan that the state Senate has tied into a sales tax revenue redistribution proposal that would shift money away from industry- and tourism-rich counties to help less prosperous areas. Overall, 97 of the 100 counties saw increases in visitor spending. Spending neared $5 billion in Mecklenburg, topped $2 billion in Wake and was more than $1 billion in Dare and Guilford counties. Visitors spent $21.3 billion statewide in 2014, a record, according to the governor’s office, and an increase of 5.5 percent over the previous year. The figures come from an annual study commissioned by Visit North Carolina and conducted by the U.S. Travel Association. The study uses sales and tax revenue data, employment figures and other data. A proposal to redistribute sales tax revenue would be dialed back under a larger economic incentive package announced last week by Senate President Pro Tem Phil Berger. A previous plan that had been added to the Senate’s version of the state budget would have shifted $12 million to $15 million away from Dare County over four years. The new plan cuts that to about $4 million, and it would affect county budgets for the 2016-17 fiscal year. Now, 75 percent of the local option sales tax — 2 cents on the dollar — goes back to localities where a sale is made with the rest redistributed throughout the state according to population. The plan that had been part of the Senate’s budget called for essentially reversing the split to 20 percent and 80 percent. 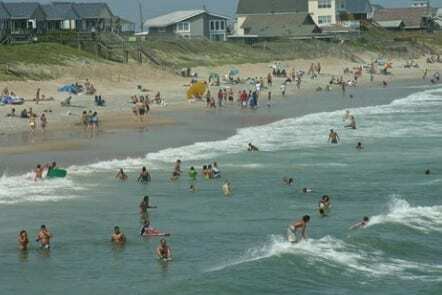 With a strong tourism industry and a relatively small population, Dare County and its towns benefit from the current formula to help pay for servicing a summer influx of visitors that is more than 10 times the number of year-round residents. The new proposal calls for distributing the money to a pre-2007 ratio of 50-50. The bill also includes economic incentives McCrory has advocated. Full tables on tourism spending can be found at partners.VisitNC.com.